Hi, I'm trying to create an annotation note in the model. Below is an example of how the annotation is constructed. And here is what the note looks like with dimensional values shown. I would like to display the tolerance as a side-by-side limits, not over/under limits (ex. .0937-.0962... .112-.172). I realize this is probably so old no one even cares anymore... but there is a way to do what you're asking for. First, rule #1: never take anything PTC technical support says as gospel...ever. At least half the time they'll tell you something is impossible even when it is possible. Often PTC technical support doesn't understand their own product as well as the designers and engineers that use it every single day. They're not very flexible. If the "answer" to your question is not in their system, "it's impossible". Sometimes you get lucky and you'll get a support tech that actually attempts to help you. Maybe they spend 5 minutes trying to resolve your issue. They try all the same buttons and switches you've already tried, fail, throw their hands up, and proclaim "it's impossible". Well, no, it's not impossible. It's a little bit of a pain in the neck but it's certainly not impossible. In my opinion, PTC's technical support personnel should know this software inside and out. They should be able to give you an answer and then let you decide if the method required to incorporate that answer is too much work. But the tech support personnel do not know the software... they're basically about as good as your everyday average "power user". They know a bit more than the basics- and the rest they get from their knowledgebase. If the answer isn't there- :shrug: oh well, it's impossible. But enough pontificating... what's the solution? Change the "14" to whatever number dimension you're intersted in. In your note, simply use &x1 and &x2 to access the limits dimensions. Pretty doggone simple... and not nearly as "impossible" as you were led to believe. The just serves to illustrate my earlier point... surely someone working for PTC as a full time tech support person should be able to offer up such a simple, convenient solution. Why don't they? Anyone... anyone... Bueller? Controls the spacing and vertical justification of tolerance values relative to the nominal dimension according to ASME or ISO drawing standards. For dimensions set to limits tolerance, this Detail option additionally controls the appearance of limits as in-line (next to each other separated by a dash) or stacked (one on top of the other). That is, when the value is set to std_asme, limits will appear in-line, and when the value is set to std_iso, limits will appear stacked. This Detail option controls the display style of dimensions when their tolerance mode is set to anything other than nominal. std_asme*–Applies American Society of Mechanical Engineers (ASME). Limits appear in-line. std_iso—Applies International Organization for Standardization (ISO). Limits appear stacked. I just received confirmation that it is not an option to have side-by-side limit tolerance in an annotation from our PTC Technical Specialist. I was hoping there was a way, but apparently not. I made notes from 2 displayed dimensions. The inline dimension was dimensioned from the end of the cylinder, and the over/under was using a dimension in section of the cylinder. I'd say there is a bug here somewhere. ...and huge opportunity for some enhancements (Brian?). Right, I noticed that if the dimension was shown in an end view that the tolerance was side-by-side, but if dimension was shown in a section, that it was over/under. The issue with that is I don't want to display the dimensions anywhere on the drawing, except for in the note. If the dimensions are not shown on the drawing, the tolerance display reverts back to over/under. From what I can tell, depths (linear dimesions) will always display over/under regardless of what view they are placed in. Yes, the problem with the two examples came about with the default diameter symbol. Somewere you have to edit this in the dimension so it doesn't show up in the dimension variable. That's a lot of manipulation to get what should be simple option to work. I'll post an idea to add the in-line and over/under option to the dimension dialog. Product Idea created. Please comment and vote if you can. We need better control over limit dimension display. 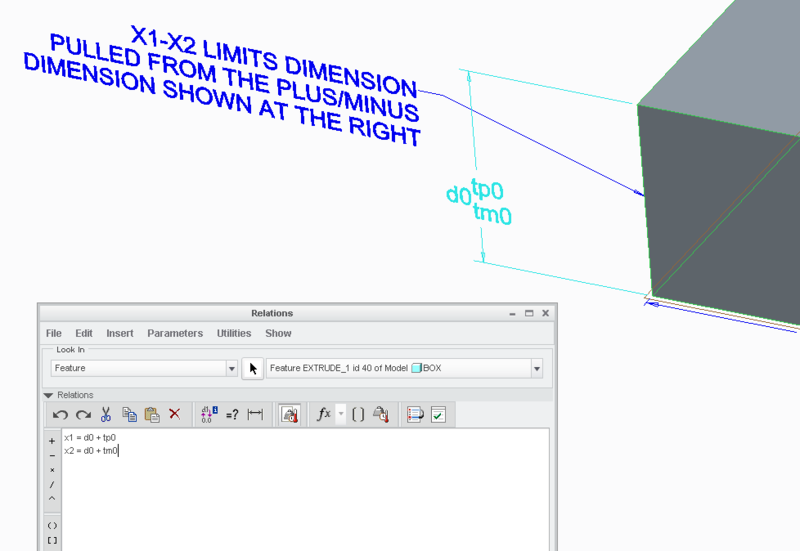 Regardless of standard settings, the dimension dialog should allow the option to show limit dimensions in-line or over/under. 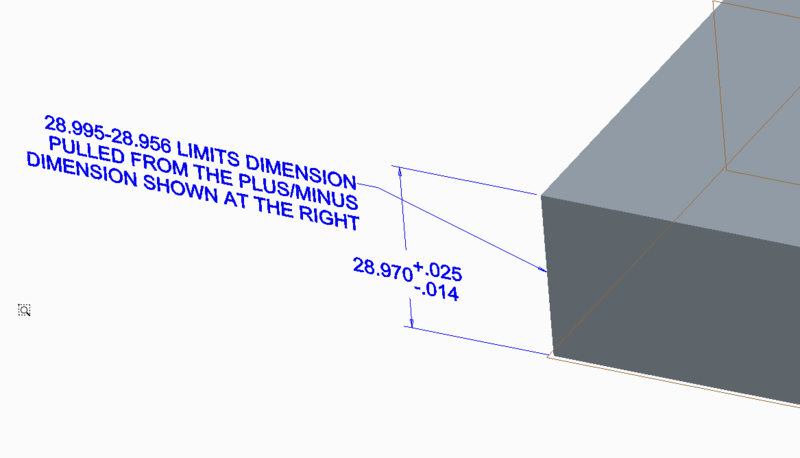 Currently, in ASME mode, diameter limit dimensions display over/under in section view and in-line in the circle's plane. A user should have direct control of this display when choosing limit as a tolerance type. This option should apply to all limit type dimensions on a case by case basis. This is why the preference to control this in the dimension properties dialog is requested. An overall default in the config.pro and config.dtl should also be added. As it stands, I do not see any way to control this requirement except to annotate the dimension in a note. There is also a bug in using diameter limit dimensions that place the diameter symbol in the wrong place when the dimension is use in a note. This needs to be corrected. Depending on the origin of the dimension (previously placed on the drawing), you get one of the two outcomes. Neither is acceptable and require cumbersome editing before they can be used in this fashion since you cannot edit the dimension style directly from the note. Using the diameter dimension directly from the drawing. Top one from the circle's plane view and the bottom one from the cylinder's section. Both dimensions are prefixed with the diameter symbol during feature generation. Proper display required editing the dimension to remove the diameter symbol from the dimension prefix and adding the symbol back in the note. Lots of mouse clicks! Control over how the dimension is displayed too is extremely cumbersome. Nice solution, Brian. now what's up with that image server! Looks like my old pix are missing on my end. I hope that solution helps Jason (original poster). The longer I've been in the role of application engineer for PTC products, the more I am amazed at how many times the community here is able to solve a problem that PTC's own CS people deem unsolveable. Once or twice, that's understandable. Looking back over the past year and a half I've been here, I think we're closing in on 50 or more. I've given the PTC UX (User Interface) people a bunch of suggestions to improve the customer support website and interface. One of my biggest suggestions was to figure out a way to leverage the community as a resource instead of just relying on the PTC internal knowledgebase. Maybe soon we'll see a shift- when CS fails, maybe the community can step in. Anyway... it's good to be able to come back and contribute an answer to a problem that CS gave up on. I'm spending this weekend working, catching up on school work, and catching up on PTC Community messages. Maybe by Monday, I'll be all caught up!